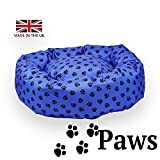 As we wrote our page recommending dog beds we realised how important having chew resistance was as a feature and what the best indestructible dog beds were. As soon as we finished reviewing the finest dog beds out there in the UK we got to work on reviewing some ‘indestructible’ dog beds right away to twin our indestructible toy page, put them all in a list and let readers know where to buy them. Why would dogs want to destroy their own sleeping area? This tough dog bed by Lifemax has been officially endorsed by the RSPCA which should give owners some peace of mind that not only will they get their own dog a good bed but also make a difference to another dog less fortunate than your own. This is a hard wearing dog bed is made of strong polyester which offers resistance to active chewers. 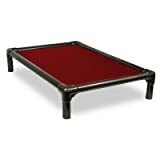 Furthermore, with a non slip base and waterproofing this dog bed also helps protects from spills whether accidental or not. The Lifemax bed is also easy to clean and has a removable inner pad for any deeper cleaning if necessary. Cool in the summer and warm in the winter, adding your own dog blankets is also an option. This is a very good entry level chew resistant dog bed that’s easy on the eye and on the wallet. Perhaps the Rosewood Tough and Mucky Dog Bed is classed more as a dog mattress than a dog bed but nevertheless deserves a space on this list. Water resistant which is a massive plus for any bed, especially if you have a young puppy or an aged dog (accidents can happen) and of course it’s chew resistant thanks to it’s shape (difficult to get a grip) and material (polyester is woven tightly to make it stronger). This is a great purchase for use in a dog basket (that might not be chew proof) or a dog crate. The material used is 100% poly cotton and has been generously filled so it’s comfortable as well as chew proof. But perhaps it’s best feature is it’s very low cost. Poly cotton pet bed mattress. Easy to fit to the Sonny bed range, or can be used on their own or with other makes of plastic pet bed. The Kuranda Walnut bed is indestructible to a dog, chew proof and chew resistant. They will get seriously bored trying to destroy this bed if thats what they try. Check out some of the reviews for this bad boy to find out for yourself. This is one of two raised beds in this list of toughies – these raised beds are taking the world by storm as more and more people are starting to realise how much dogs love these as it allows them to stay cool or warm at all times. We recommend complimenting the bed with a nice doggie blanket or even a flat bed on top (there’s one of these in the list that would be ideal). Lastly, I’m sure you will have noticed the price of this bed and the risk if your dog ends up not loving it and we can’t blame you for that. However, take the time to read the reviews and you’ll notice it’s an investment as you may never need to replace this bed for years and year and in the long run may in turn save you money. After all, this bed is indestructible! Remember the big mattresses used in school physical education classes? The Maximum Chew Resistant Flat Bed is just like that but a bit slimmer and made for pooches. This is a chew resistant dog bed as opposed to invincible or indestructible and can resist digging as well. The cover of the bed is made of tough nylon and comes in a wide variety of covers and sizes to suit any pooch. As you can tell by the shape, this is a perfect indestructible dog bed for crates just make sure to get the measurements right. Not too expensive, not too cheap and easy to clean this is a good choice for anyone. The Tartan Indestructible dog bed is probably the closest one to a ‘normal’ dog bed you’ll find on this page. Traditionally donut shaped with a tartan design, this bed is more on the comfort side than the chew proof side but still deserving of a spot on this list. Paws claim that dogs will not get through the lining which is where the indestructible comes from. It’s a bold claim but if you check their reviews maybe they have a point? This product is best wiped clean as opposed to machine washing as it is on the heavy side. 600 Denia waterproof material with a PR lining on the inside. Very hard wearing. Fits conveniently in may places in the house or even in your car. The heavy duty oval bed by P&L is one of the best choices on the entire list. Made of 100% strong woven polyester much like most of the indestructible beds on this list P&L obviously ticks that all important point off the list. But it’s the effort P&L have made to create a comfortable bed with high walls is what sets it apart from the competitors. Sure, you will be paying a higher premium for this bed but you do get a ‘superior’ bed in exchange. Hard wearing, chew resistant and comfortable – is there anything else you want from a bed, really? Most raised dog beds are at the very least hard wearing or indestructible purely because of the way they’ve been built and the materials used. The Pet Living raised dog bed has a flat canvas fabric which is stretched to give a supporting, raised platform for your dog, the canvas itself is a tough fabric and as it is stretched it is very difficult for any dog to get their jaws on. However, it is not that difficult to dig on so take that on board. The second part of the bed’s toughness is the powder coated metal frame the canvas sits on,obviously still is practically invincible to a dog! 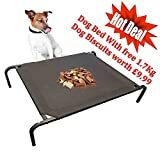 This is a bed that may not look like it’s for everyone but check the reviews and give it a try, you’d be surprised how many dogs love it! Add a couple of blankets on top for extra comfort. Breathable fabric offers the extra comfort Lightweight and portable.Powder coated metal frame. Chew resistant, easily washable, thicker for comfort and with a small variety of colours. The Ginger Ted durable dog mattress is a good choice or those who want a bed for the crate or a raised dog bed or as a stand alone bed (it can still do that. Some have report a lack of chew proofing with very large dogs such as Boston Terriers but should suit most other dogs. May even suit your late dog depending on how well trained they are. As it is also waterproof this is a great bed to place next to a heater for them to lie on after a wet walk, the machine washability also makes it great if the walk was particularly mucky! Low on the price side, decent on the quality side makes it really good value for money. 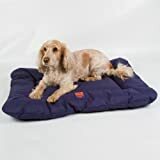 The durable dog cushion is a waterproof and chew proof which has the added bonus of being bed bug and flea larvae resistant thanks to the sleep outer cover, which can also be removed at any time. As this is shaped like a pillow it offers a different solution to the others we’ve shown here. This dog cushion is generously filled which adds extra comfort on top of the desired chew resistance which we presume you’re after. It’s not the strongest in this list but leans more towards the comfort side. This is a balanced dog bed which has a lot of plus points but doesn’t excel in any particular area either. Can usually be picked picked up for less than £30 which is decent value for money. new range of very hard wearing dog beds that is not only waterproof to keep your pet dry at all times but also has a totally removable cover that can be washed when required. 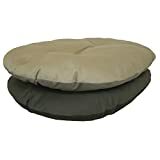 This hard wearing pet cushion is another indestructible dog bed worth thinking over. A wider prospect with nicer patterns than some of the other choice and quite plump in size. Odour resistant, chew resistant, removable and washable cover makes this another decent choice which isn’t the best in any particular area but isn’t poor in one either. You can see the image above to gauge the scale of the size of the product. It almost has to be said, that the K9 Ballistics Chew Proof Dog bed is probably the creme de la creme of indestructible dog beds in this entire list by a long shot if it were indeed indestructible, it’s a shame that it isn’t. This fur covered dog bed is not only extremely comfortable that allows dogs to truly sink in to it just like a human would into a luxury mattress. The word indestructible is a tricky one. It describes an object that is unbreakable and can not be destroyed. You will be hard pressed to find a dog bed that is truly indestructible and we would imagine that being indestructible will almost always be missing from the terms and conditions of an item. However, when JugDog refer to bedding as indestructible what we mean is it’s incredibly tough, chew proof or chew resistant and should outlast conventional beds by a long mile. We do not mean indestructible literally. This question is a bit of a tough one to answer as we can’t speak on behalf of the pooch, however we can make certain assumptions. Many dogs, probably yours if you’ve stumbled on this page, love to chew stuff. They will literally chew anything. Dog’s teeth are extremely important to them as they are very oral animals who essentially use their mouths as a hand, as such clean, sharp teeth is a very important thing to have. This is what leads dogs to start to chew from the time they’re puppies all the way till the end. Chewing is a learned behaviour and a dog bed is just another object to be chewed for them just like a chew toy, your socks or anything else. If your dogs have been chewing on their beds and you are sick of it then please be rest assured it’s normal behaviour but we’ve got you covered with some belting choices for chew resistant dog beds here on JugDog.co.uk! So, here we are with chew proof dog beds. You want your dog to have its own bed but you’re sick and tired of having to replace it non stop at a huge cost to you the owner. A chewed dog bed become uncomfortable for the dog itself and if its a bed that’s filled with fluff then it can become real messy real quick. If you’re looking for chew resistant/proof dog beds there are a couple of points you should consider. Tough dog beds are designed with durability in mind first, this means that its design, comfort and price come after. If you’re more concerned with how comfortable they are then we recommend sticking with this list of dog beds. However, if being indestructible is the most important feature for you then please read on. Tough dog bedding can be made in a few ways – some can have metal frames to make it difficult to wrap their jaws on (prevent chewing entirely) while other beds will be made using chew resistant material (they can chew, but will make them unable to tear the material). The goal here, is to make the beds do difficult to chew that they will simply get bored of even trying and using the bed like the bed should be used – to sleep and relax in! Without further ado, let’s take a look at some of the best indestructible and chew proof dog beds available in the UK! 5%saving5%saving hi. Can you help please. I need indestructible beds. I have three boys two rescue and a 2 yr old puppy. The rescues have pretty much finished chewing beds but the puppy … no chance. But he doesn’t chew his he chews, tears , digs and bites into the foam under the cover into big mouth pieces and flips them till he has them at the home and we play grab ! !😩😩😩🙄🙄good game !!! But he only does it at meal times and occasionally at bed time , but again to his brothers bed ! Just the sofa one. His older brother likes his setter and had an orthopaedic one which lasted really well till Freddie. Everything in our house is becoming till Freddie lol. I’m thinking ok one spend on Freddie resistant stuff and that should be ok. So , I’m needing three beds fir outside which can be the plain gym mat type but off the floor nicer snuggly beds for their night time beds. We are emigrating to Cyprus later on in the year but feel it’d be good to be armed before we go. Weth the flat plastic ones should they get hit at all could we dip in the pool to cool off ? The two rescues have bone problems so heat and comfort are good for them. Thanks for taking the time to comment. I am not sure what you’re asking but if you are after a tough bed then any of our above recommendations should suit.